Saturday, June 30th , 2018, 1 p.m. – 2 p.m. Visitors rave about Museum Interpreter John Ericson’s detailed and engaging tours of Historic St. Luke’s Church. Ericson has expanded his repertoire to include lectures on subjects such as the relationship between history and memory, the connection between the Lutheran and English Reformations, and how the Constitution deals with issues of religious freedom. 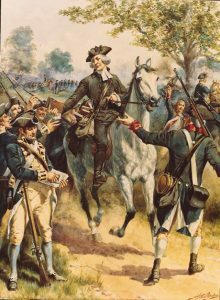 Join us on June 30th as Ericson discusses the relationship between religion and the American Revolution. The presentation will explore how the clergy entered the political sphere during the revolution, causing both Patriots and Loyalists to often interpret the conflict through the lens of their religious faith. Tickets are $15 per person. Seating is limited so advance ticket purchase is encouraged. Light refreshments will be provided.